Dr. G. Randall Evans graduated from Texas A&M University Commerce with a B.S. degree in biology. He was awarded membership in Beta Beta Beta National Biological Honor Society. Dr. Evans started his dental practice in Greenville in 1978 after earning his Doctor of Dental Surgery degree from Baylor College of Dentistry in Dallas. He received the Fellowship in the Academy of General Dentistry in 1991. He is a member in the Texas Dental Association, American Dental Association, and Academy of General Dentistry. Dr. Evans is married to Dee who is a realtor with Ebby Halliday. They have one daughter, Brittany, who attends Southern Methodist University. Dr. Evans serves on the vestry of Holy Trinity Episcopal Church. In his spare time he enjoys golf and fishing. Dr. Daniel graduated with a Bachelor of Science degree in Biology from Mississippi College in Clinton, Mississippi in 1994. He was awarded membership in Beta Beta Beta National Biological Honor Society. He earned his Doctor of Dental Medicine degree from the University of Mississippi in 1998. He practiced dentistry for five years at Mississippi State Hospital with a special emphasis on elderly and special needs patients. He joined his uncle’s practice in 2003. 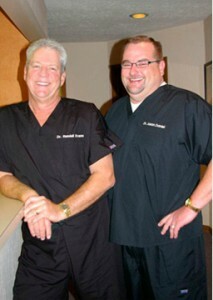 Dr. Daniel has lives in Greenville and has one son in High School. They attend Wesley United Methodist Church. Dr. Daniel enjoys spending his spare time coaching baseball and soccer as well as hunting and fishing.